The Tommy Moore Cup still hadn't left the Shamrocks dressing-room for its seventh trip to Ballyhale, but Henry Shefflin was already succession planning for decades to come. "You imagine all the kids in Ballyhale. What will they want to do tomorrow morning? They'll want to hurl," he said. What's more they'll want to hurl like the Fennellys, TJ Reid, Adrian Mullen and all the others who made consistent excellence look so simple in Croke Park yesterday. Ballyhale were superb across all departments, making Shefflin's first venture as manager in an All-Ireland final a whole lot more comfortable than he or anyone else would have envisaged. Galway clubs, including St Thomas', who won the title in 2013, have a good record in All-Ireland finals, but on this occasion they were no match for a Ballyhale side that laid the groundwork in a first half which they won by five points (2-10 to 1-8). St Thomas' were barely hanging on and they were outscored by 0-17 to 0-3 in the second half before David Burke nudged home a consolation goal deep in stoppage-time. Injury issues before and during the game weakened their hand but even if everything had gone right for them, they were up against a vastly superior force. "Ballyhale are a phenomenal side. Even some of the players who are lesser known nationally were outstanding. Adrian Mullen was just ridiculous out there," said St Thomas' manager Kevin Lally. It was obvious right from the start that Ballyhale were in perfect harmony with the demands of the occasion. They led by 1-4 to 0-1 after five minutes, the goal coming from Colin Fennelly, who finished with 2-4. St Thomas' responded well, with a penalty goal from Conor Cooney. It was level at 1-6 each after 20 minutes but Fennelly pounced again two minutes later, deftly guiding the ball to the net. 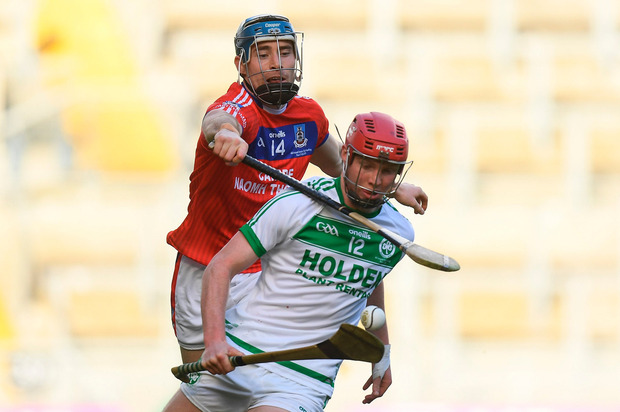 By half-time, Ballyhale were five points clear and while St Thomas' scored the opening point of the second half, it was no more than a token gesture of defiance. Ballyhale took over in all sectors, scoring a string of points from various angles and distances. Fennelly, TJ Reid and Mullen finished with a combined total of 2-18, while six others got in on the scoring act too. The second half was no more than shooting practice for Ballyhale, whose rate of improvement over the last year has been remarkable. Their biggest challenges came in the Kilkenny semi-final and final and, once they survived those, they swept through Leinster virtually unchallenged before beating Balygunner in the All-Ireland semi-final. Qualifying directly for the semi-final as Galway champions before edging past Cushendall left far more questions over St Thomas and they just weren't at the same level as Ballyhale. Still, they would have been expected to offer a stronger challenge, even against such powerful opposition but they were very vulnerable in defence. And, as the points sailed over throughout the second half, Shefflin could stand back contentedly admiring the fruits of all the hard work being bountifully harvested. So what was his immediate emotions after the biggest success in his short managerial career? "It feels strange. Little did I think when I took on this job that it would end up here. It has been an amazing journey, some amazing days along the way, some very sad days too, burying Eoin Doyle," he said. Eoin, a member of the Ballyhale squad, was killed in a road accident last April. "I think Eoin was watching down on us. 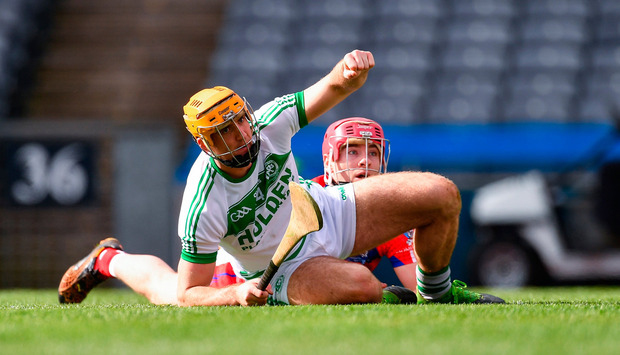 Things went our way," said Shefflin. The reverse was the case for St Thomas', who had to start without Eanna and Kenneth Burke, and lost Fintan Burke and James Regan to injury in the second half. 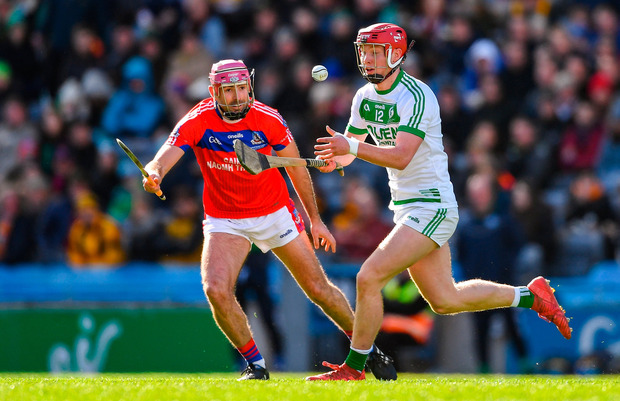 Ballyhale had injury problems too but Shefflin explained that the long wait since the semi-final worked in their favour as it gave players time to recover. They were all on full throttle yesterday, delivering as complete a performance as Shefflin could have wished for. "From the get-go the lads have applied themselves very well. It was great to come up here and perform like they did, particularly in the second half when they showcased all their skills.," he said. "Colin's second goal was brilliant. It was just the confidence he showed. That goal gave us a great grounding and we pushed on from there." The basis for this success was, according to TJ Reid, laid 14 months ago when the squad committed to improving in whatever way they had to. "The transition of this Ballyhale team has gone through the roof. That's partly down to a whole new management team, a whole new structure, a freshness and young boys coming in," said Reid. So what exactly did Shefflin bring? "He's a modern player - he's only after retiring in the last year. He's modern in terms of how the game is changing. Overall his hurling brain and his leadership and his motivation is great." Scorers - Ballyhale: C Fennelly 2-4, TJ Reid 0-9 (5f), A Mullin 0-5, E Cody, B Cody, P Mullin 0-2 each, E Shefflin, R Reid, R Corcoran, M Aylward 0-1 each. St Thomas': Darragh Burke 0-7 (5fs, 1 '65'), C Cooney (pen), David Burke 1-0 each, B Burke, D McGlynn, J Regan, B Farrell 0-1 each. Ballyhale Shamrocks - D Mason; D Mullen, J Holden, B Butler; E Shefflin, M Fennelly, R Reid; ; R Corcoran, P Mullen; B Cody, TJ Reid, A Mullen; E Reid, C Fennelly, E Cody. Subs: M Aylward for E Reid (41), C Walsh for Corcoran (54), J Cuddihy for E Cody (57), K Mullen for D Mullen (57), G Butler for M Fennelly (59). St Thomas' - G Murray; C Mahoney, C Burke, S Skehill; D Cooney, S Cooney, F Burke; J Regan, David Burke; D Sherry, Darragh Burke, B Burke; B Farrell, C Cooney, D McGlynn. Subs: M Caulfield for F Burke (49), C Fallon for Regan (52), C Kelly for Sherry (56), D Finnerty for McGlynn (59).